University of Dayton students are working this summer to find creative solutions to real-world challenges posed by the Air Force Research Laboratory, Emerson's Helix Innovation Center and the University of Dayton Research Institute. The Collaboration Accelerator brings together students majoring in mechanical and civil engineering, marketing, communications, visual arts and international studies, along with a recent Sinclair Community College graduate, to work on unmanned aircraft systems, additive manufacturing and connectivity. The 11-week paid internship program is led by the University’s Institute for Arts Nexus (IAN), with mentors from the School of Engineering. Students will travel to several locations, including the Research Institute, Sinclair’s UAS lab and The Helix, before presenting their final project to partners and community members on July 22. The Collaboration Accelerator grew from the mission of IAN, to design programs and experiences that will equip today's students with the imaginative and creative skills necessary to excel in the global workforce, regardless of their discipline or degree. Learning creative and innovation theory and then applying that theory to real challenges will be central to the students' Accelerator experience. A pilot program last summer — dubbed Accelerator 1.0 — was a partnership between the University, AFRL, the Wright Brothers Institute and The Collaboratory. The idea stemmed from a shared vision for transforming the way people and organizations create and interact in our community, as well as a commitment to collaborative imagination, creativity, innovation and action. Fostering fresh perspectives is at the heart of The Helix Innovation Center's mission, according to Rajan Rajendran, vice president and director of The Helix Innovation Center. His challenge to the students is to consider what “connectivity” will mean to people in 2050. "Engaging in creative work with the students is what we look forward to," Rajendran said. "We want to see what matters to these young, bright and creative students, and how they think about and process the world around them. This helps us learn and grow as an organization, as well." AFRL has asked the students use unmanned aircraft systems technology in a way that serves the public good. "AFRL is deeply invested in understanding how technology impacts its operators,” said Reid Melville, an Air Force technology strategist. “Now with Accelerator 2.0, we move further, to ask how technology impacts society." The Research Institute has challenged the students to use additive manufacturing to create a product that reduces energy use. David Dunn, senior sustainment engineer and group leader at the Research Institute, explained the potential of additive manufacturing — which builds a product layer by layer rather than cutting away or molding material — by showing them a part from an F-16 fighter jet from the 1970s. The original mold for the piece has been destroyed, he said, and making a new one would be expensive and take months. However, with additive manufacturing, the piece could be recreated in days using much less energy. Their challenge from the Research Institute, he said, is fairly opened-ended. 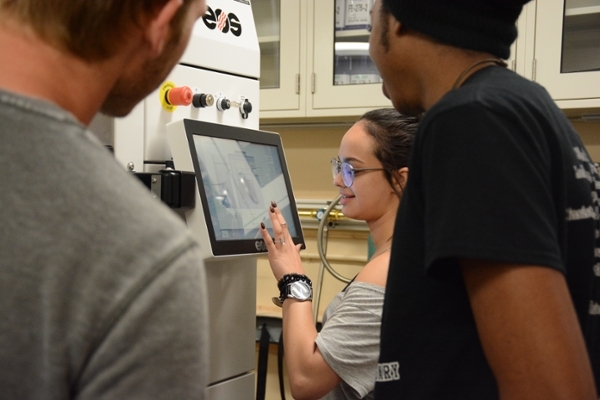 The students can make any product, so long as it demonstrates additive manufacturing’s ability to reduce our energy footprint, the more reduction the better. They will also have access to the Research Institute's machines to prototype it. More information is available on the program is available on the University’s website.